An alias is a tiny file that automatically opens the file that it represents. Although an alias is technically an icon, it’s actually an icon that opens another icon automatically. You can put aliases in convenient places, such as on the Desktop, to help you easily open programs and files that you access often. In effect, Microsoft stole the alias feature from Apple (if you’ve used Windows, you may know aliases as shortcuts). However, aliases usually don’t break when you move or rename the original file; shortcuts do. An alias is different from a duplicated file. For example, the Microsoft Word 2004 application uses 19.4 megabytes (MB) of disk space. A duplicate of Microsoft Word 2004 would give you two files, each requiring nearly 20 megabytes of space on your hard drive. An alias of Microsoft Word 2004, on the other hand, uses a mere 52 kilobytes (KB). Convenience: Aliases enable you to make items appear to be in more than one place, which on many occasions is exactly what you want to do. For example, keeping an alias of your word processor on your Desktop and another on the Dock is convenient. You may even want a third alias of it in your Documents folder for quick access. Aliases enable you to open your word processor quickly and easily without navigating into the depths of your Applications folder each time that you need it. Flexibility and organization: You can create aliases and store them anywhere on your hard disk to represent the same document in several different folders. This is a great help when you need to file a document that can logically be stored in any one of several files. For example: If you write a memo to Fred Smith about the Smythe Marketing Campaign to be executed in the fourth quarter, which folder does the document go in? Smith? Smythe? Marketing? Memos? 4th Quarter? Correct answer: With aliases, it can go in all of them if you like. Then you can find the memo wherever you look, instead of guessing which folder you filed it in. With aliases, it doesn’t matter. You can put the actual file in any folder and then create aliases of the file, placing them in any other applicable folder. Integrity: Some programs must remain in the same folder as their supporting files and folders. Many Classic programs, for example, don’t function properly unless they’re in the same folder as their dictionaries, thesauruses, data files (for games), templates, and so on. Thus, you can’t put the icon for those programs on the Desktop without impairing their functionality. An alias lets you access a program like that from anywhere on your hard disk. When you create an alias, its icon looks the same as the icon that it represents, but the suffix alias is tacked onto its name and a tiny arrow called a badge appears in the lower-left corner of its icon. 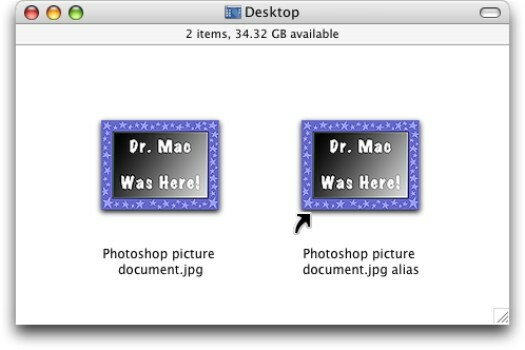 Figure 1 shows both an alias and its parent icon (that is, the icon that opens if you open the alias). Figure 1: An alias icon (right) and its parent. Click the parent icon and choose File –> Make Alias. Click any file or folder, press and hold down the Command and Option keys, and then drag the file or folder while continuing to hold down the Command and Option keys. Presto! An alias appears where you release the mouse button. Better still, aliases created this way don’t have that pesky alias suffix tacked onto them. The alias appears in the same folder as its parent. Deleting an alias is an easy chore. To delete an alias, simply drag it onto the Trash icon on the Dock. That’s it! You can also Control-click it and choose Move to Trash from the contextual menu that appears, or select the icon and use the keyboard shortcut Command+Delete. Select the alias icon and choose File –> Show Original. Select the alias icon and use the keyboard shortcut Command+R.